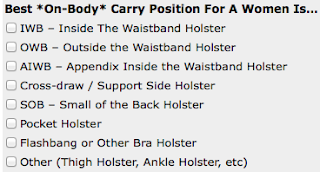 John Lott's Website: Where is the best place for a woman to carry a gun? Thanks for the link! I'm really curious myself to see what the answers will be, because it'll give everyone who has had to give advice to women who own or want to own a gun.